The mornings in Costa Rica are beautiful. We were greeted with a crisp sunrise and the sounds of airplanes soaring above as we started our international adventure at the Hampton Inn in Alajuedo, Costa Rica. Breakfast was fantastic. Traditional Beans and Rice, a variety of passion fruit, and the specialty meal of stuffed tortillas provided for an incredible start to our day. 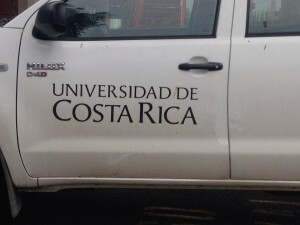 We first sojourned to the University of Costa Rica, where we were introduced to the geography, traditions, crop life, and economics of this beautiful country. One of the professors spoke about these topics with passion as he shared his deep-felt love for his homeland. After this, we went onward to an insect museum. This museum helped to acquaint us with the entomological systems of the native land. We learned about the many different types of insects, their behaviors, and the nutritional values that they offer to the people of the world. Following our tour of the museum, we were given the opportunity to indulge in an insect treat. 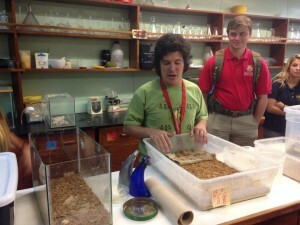 Frederico, our tour guide, taught us how to prepare insects for consumption. Using curry powder, water, and a hint of salt, a plate of insects became a protein meal. While some chose not to capitalize on this remarkable cultural opportunity for reasons unknown, many did choose to consume the bugs; and they thoroughly enjoyed them! As the day progressed, we went on to participate in a much more balanced meal at the home of a local Costa Rican family. The food was incredible, and the hospitality they offered us was even more so! From here, we were able to enjoy a scenic view of a distant volcano. This view was breathtaking—reflecting the heart-stopping beauty of such a magnificent treasure of Central America. Afterwards, we went to enjoy an informative tour of the Agronomy Research Center. This next adventure offered us the opportunity to see some of the priceless fruits of Costa Rica in their natural habitats. We enjoyed tasting fruits that we had never experienced before, or that we were not really familiar with. The fruit was amazing, and everyone loved it! Leaving the Agronomy Research Center, we went to our final event of the evening—a historic Chocolate Dinner! 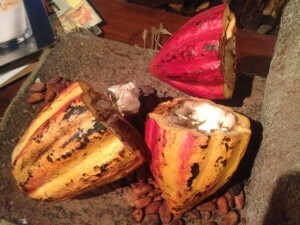 Sibu, a Costa Rican chocolate shop, provided an interactive tour through the history of chocolate. 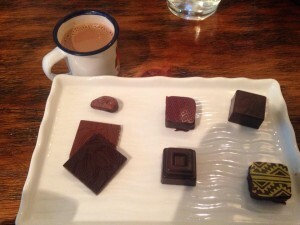 We learned how chocolate had evolved and changed over time, all while being able to perceive it with edible examples! This experience was truly fantastic, and will be one that I never forget. The dinner that followed brought a pleasant and relaxing close to such an eventful day, and an even more educational evening. Learning about Costa Rica by experiencing it has truly been a reminder of why “learning by doing” is so important. Some of the same things that I had read about in textbooks, or watched on the television, came to life. In fact, they became a part of my life. With such incredible memories forged by day two, I can only imagine what’s in store for tomorrow. I can’t wait to enjoy another day of the “pura vida” (Pure Life) of Costa Rica!